If a Jaguar F-Type rear-ended a Jaguar XF, and then they somehow got taller when that happened, you'd have this, the Jaguar C-X17 Concept. And yes, you're allowed to like it. In fact, you'd be out of your mind not to. We've seen the front from a couple of angles, and now that we've seen it from all angles, I have to say that it is one of my favorites. Without even being in production, the C-X17 has instantly become one of the best looking SUVs built. That was easy. Concept cars are expensive to build, so a lot of what you see will make it to the production car (come on, Jag would be crazy to not have a crossover), but parts like the interior will need to be more based in reality before they see dealers. When it goes on sale it will supposedly be called XQ. With the Audi Q7/Q5 and the Infiniti QX SUVs, it seems Q has now become the official letter of crossover SUVs. Still, I can't get over how good it looks, especially with that F-Type-y rear light treatment and large air intakes up front. And I intend the remark about the rear-end collision of the F-Type and XF as a compliment. This is not a case of early Porsche Cayenne, which I believe people said looked like someone backed a 911 into a shed. Ian Callum is a man that doesn't make ugly things. 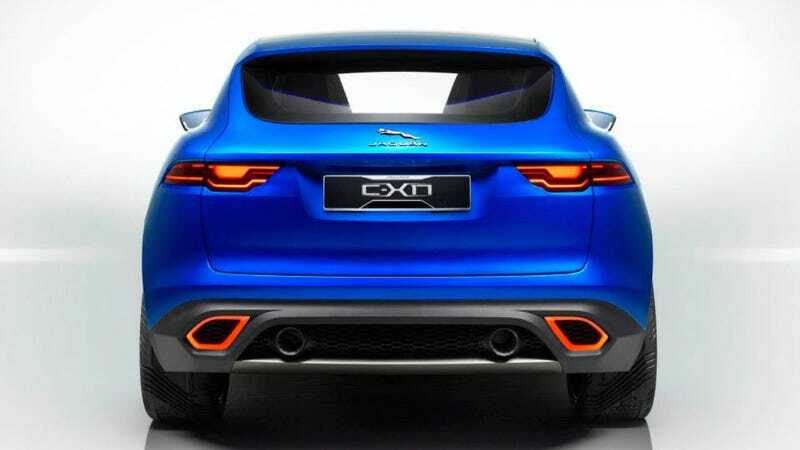 I'd always thought that a Jag crossover would be ugly and detract from the brand. I told one of their chief engineers that at one point. I need to eat my words. I really like this thing. For once, I'm also glad a car doesn't look like the renders. We'll have full details on the powertrain (I'm betting it's either a plug-in hybrid like every other concept car or a big V8 because Jag likes big V8s) later on this morning when the C-X17 gets its full reveal in Frankfurt.